The world’s mineral and metal reserves are dwindling, but that doesn’t mean it’s time for development to switch into reverse gear. If we could redesign our profligate industrial processes, say circular economists, we could put a stop to our throwaway habits without sacrificing growth. Instead of burning or burying millions of tonnes of waste every year, we could take today’s garbage − even the fragments of plastics that hapless seabirds ingest − and use them as the building blocks to make anything from carpets to laptops. Although the circular economy is often mentioned in the same breath as recycling, the two should not be conflated. Renewable energy has for the first time surpassed coal in supplying the UK’s electricity for a whole quarter, according to government statistics released on Thursday. The revelation of the surge in wind, solar and bioenergy to a record 25% comes in a week when the government has been heavily criticised by business leaders and Al Gore for cutting support for clean energy. The high performance of renewable electricity between April and June, the latest period data is available for, was due to both more wind and sun and more turbines and solar panels having been installed, compared to the same period the year before, when renewables contributed 16.4% of electricity. USA – It just took one utterance from Pope Francis – “earth” – to rouse cheers from the climate campaigners who had gathered on the Mall to watch the pope’s historic speech to Congress. The pope’s visit to what remains a fortress of climate denial among the Republican party leadership greatly boosted hopes among campaigners of elevating climate change from a narrow, partisan issue to a matter of broad public concern. What if there were an affordable programme to prevent catastrophic climate change and provide the finance that developing countries need to end poverty by 2030? … A decade ago, big ideas were on the table: timetables for donors to reach 0.7% of national income on overseas development assistance (ODA); cancellation of all debt to the World Bank and IMF; a development trade round. Today, by contrast, it’s like watching tumbleweed roll across the desert. The Addis Ababa finance for development summit agreed on next to nothing to deliver the SDGs; tomorrow’s gathering in New York is unlikely to do much better. On climate, meanwhile, no one (including Christiana Figueres, the head of the UN Framework Convention on Climate Change) believes a 2C deal is in prospect. But what if there were a big idea that could achieve both? UK councils have invested around £14bn – equating to 6% of their collective pension funds – into risky fossil fuels, according to new figures released today (24 September). The research comes from consumer group 350.org, which warned that much of the planet’s fossil fuel reserves will have to stay in the ground, meaning oil and gas companies could be holding billions of pounds of ‘stranded assets. As well as the financial risks, 350.org said Councils had an ethical obligation to divest from fossil fuels. Life’s genome is a vast repository of ancient knowledge. After 3.8 billion years of scrambling, shifting and selecting ideas that work, the diversity is staggering. Today, we’ve named 1.6 million species, and every year, scientists report 15,000 more. New species turn up in forgotten museum drawers — it’s hard to keep pace. Just a spoonful of soil contains 10,000 bacteria — many new to science — and each one contains a unique toolkit of adaptations honed by billions of years of trial and error. The ancestors of every creature alive today spent billions of years inventing new ways to make a living. In the quest to find prey and avoid becoming it, mate and raise young to mating age, those pioneers found open niches — new ground on which to set seed and spread. Their descendants’ dazzling array of strategies and structures are our collective intellectual property as Earthlings — the ultimate Creative Commons. There’s no tongue on Earth rougher than a limpet’s. Covered in hundreds of tiny teeth, it scrapes rock to shreds with every lick, so the limpet can feed on the microorganisms that live there. And it’s a good thing it does. Without limpets eating through the rocky surface our intertidal zones would soon be overrun with a blanket of algae, leaving little room for other species. It’s the limpet’s key role as keepers of marine biodiversity in this zone that interests researchers like University of Sydney PhD student Aline Sbizera Martinez. Many orangutan conservation bodies work closely with local partners and communities. But these collaborations tend to receive far less attention in online conversations and popular perceptions of the orangutan “crisis”. And when local communities do appear in conservation material, they’re often cast as either victims of deforestation or as “ecologically noble” allies who simply need to be educated about conservation. But as any anthropologist would point out, real life is far more complicated than that. Even the most exotic groups have internal divisions, ambitions, political leanings and ethical dilemmas. Not everybody is an instinctive defender of the forest or subscriber to Western conservation values. Putting out birdfeed in Britain’s gardens is shifting the migration of one particular winter visitor, the blackcap, scientists say. Researchers from the British Trust for Ornithology used data from a 12-year garden bird survey in their study. This revealed that many blackcaps from Central Europe had shifted their winter migration, partly because of the supply of garden food in Britain. The findings are published in the journal Global Change Biology. It might be hard to notice but there is a boom of sorts occurring in Helmeted Honeyeaters, Victoria’s critically endangered bird emblem. But when only 150 remain in the wild, a boom is a relative concept. 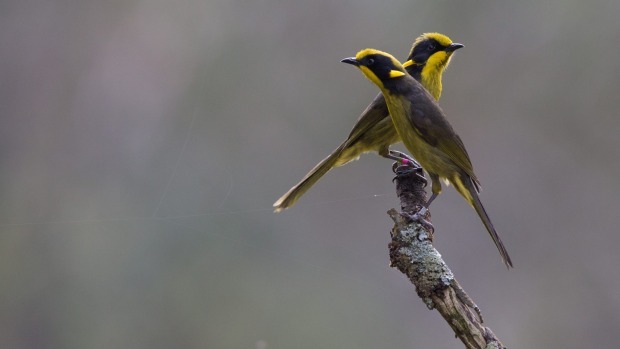 On Wednesday scientists and conservationists gathered in the last remaining home of the critically endangered species – the tiny Yellingbo Nature Conservation Reserve on Melbourne’s northern doorstep – and released a precious cargo of 18 birds bred in captivity, giving the wild population a boost. Earth, spice, dark berries, and a faint hint of … microbes. A new study of New Zealand’s six major wine-growing regions has uncovered an intriguing hidden factor in what sets the flavours and aromas of vintages in one region apart from another. Until now, the difference in tastes and smells has generally been put down to a mix of environmental influences like climate, soil minerals and local agricultural practices. But that assertion has been challenged by an experiment revealing that tiny genetic differences in just a single microbe could help give different regions their unique geographic signatures. AUSTRALIA – Stockland will install three more rooftop solar systems on its shopping centre portfolio following the success of its $2 million Shellharbour PV system, currently Australia’s largest single rooftop solar system at 1.22 megawatts. The announcement was made today at the Shellharbour shopping centre, where NSW energy minister Anthony Roberts and environment minister Mark Speakman attended for a rooftop tour. “With Stockland Shellharbour now generating clean, green, renewable energy for the centre and our tenants, with cost savings for all, we now have the confidence to invest in similar installations – with our Wetherill Park, Merrylands and Baldivis centres next on the list,” Stockland group executive and chief executive commercial property John Schroder said. Supermarket giant Woolworths has failed to hit its “ambitious” target of eliminating food waste sent to landfill by 2015. However, it believes it can reach its goal in five years, partly through establishing a partnership with food rescue charity OzHarvest, which will help divert more food onto the plates of the homeless and disadvantaged. “It is an ambitious target. We made progress, but it isn’t where it needs to be,” Woolworths’ managing director of supermarkets, Brad Banducci, said. “We need to focus harder and work harder to do it and that’s why we wanted to have this partnership with OzHarvest. Trials of monthly bin collections in the UK are “an obvious next step” to tackle the UK’s stalling recycling rates, waste management experts have told the Guardian. Fife council have begun trialling once-a-month collections for landfill bins, with recycling bins and food waste taken more often. The nine-month trial in Fife is a UK first, reports the BBC, although other councils have already tried three- and four-week collections. For Boston cyclists, Massachusetts Avenue can be a terrifying place to ride—drivers routinely ignore the stripes marking the bike lane and swerve into the path of bikes. After a truck driver recently killed one young bike commuter, the city promised to add some simple barriers to the lane. But they were slow to act. So another bike commuter decided to take on the problem himself: On his way to work in Harvard Square, Jonathan Fertig dropped off a line of orange construction cones and potted flowers along the edge of the bike lane. Rising concern over the ability of Middle Eastern countries to grow food has led to the first ever request for a deposit from the “doomsday” seed vault in a frigid corner of Norway. Thanks to Syria’s civil war, the region’s primary seed vault in Aleppo has been damaged and taken off line, amid fighting that has left several hundred thousand dead and forced an estimated 11 million to become refugees. As ISIS controls part of Syria and refugees stream across Europe, destruction of antiquities and infrastructure continues. Syrian scientists have re-established the International Center for Agricultural Research in the Dry Areas in Beirut and this week asked for some of their seeds back from the doomsday vault in order to restart their collection. Millennials are universally more engaged in corporate social responsibility (CSR) efforts, according to new research from Cone Communications. This includes everything from buying products associated with a cause they care about to using their online networks to amplify social and environmental messages. The 2015 Cone Communications Millennial CSR Study reveals that more than nine-in-10 Millennials would switch brands to one associated with a cause (91% vs. 85% U.S. average) and two-thirds use social media to engage around CSR (66% vs. 53% U.S. average). Unlike the Millennium Development Goals (or MDGs) that applied only to developing countries, the Sustainable Development Goals (or SDGs) will apply to all countries, including Australia. The new goals will have a key goal of eradicating extreme poverty, but they also have a much wider agenda… The SDGs offer the opportunity for a “win-win” for Australia: by promoting more sustainable development we can improve the quality of life and opportunity here in Australia while also promoting prosperity in the many developing countries in our region. This will be vital for our economic future and security. AUSTRALIA – What should we expect if our revitalised government were really to look forward to the 21st century? How can we be confident it isn’t just better sizzle but the same dodgy sausage? Let’s look at one broad concept that has rapidly become a vital consideration for this century: sustainability. We should be trying to manage the transition to a genuinely sustainable future. That should not be controversial. After all, the Council of Australian Governments (COAG) adopted the National Strategy for Ecologically Sustainable Development way back in 1992. The principles of that agreement include maintaining the integrity of natural systems, nurturing our biodiversity, recognising the interests of future generations, and accepting our global responsibilities. AUSTRALIA – Voters have overwhelmingly rebuffed the government’s so-called “vendetta” on green groups, with new polling showing 70 per cent oppose any move to deny charity status to environment groups. Removing such groups’ charity status, first proposed by key Tony Abbott backer Andrew Nikolic,​ could cost them hundreds of millions of dollars in tax-deductible income, and severely restrict their capacity to campaign on environmental issues. Pressure has been building on the government to abandon the proposed changes, with Labor and the Greens flagging they will oppose any moves it makes on the matter. NEW ZEALAND – … Paris can be a watershed moment; the choices made there could determine whether our planet is a viable one on which we can all live. Already, we have Tuvalu’s Prime Minister seeking to move his entire population to another country. Any agreement to come out of Paris must be legally binding; it must commit, by law, all countries to cut their emissions, and it must prevent governments backsliding in the face of political or economic change. The New Zealand delegation to Paris, led by Minister Tim Groser, is pushing for countries’ emission reduction targets to be non-binding, meaning governments could walk away from them at any time. AUSTRALIA – A big idea: around 150 vacant buildings and the sweat, equity and creativity of people can be the ingredients that transform a city, as Renew Newcastle has so dramatically demonstrated. Marcus Westbury, founder of the organisation that has gone on to inspire up to 50 communities nationwide under the Renew Australia banner, said the movement was also resulting in the creation of viable, sustainable businesses leveraging the global market place created by the internet to bring money into their towns and cities. He has just published a crowd-funded book, Creating Cities, that details the evolution of the Renew Newcastle and Renew Australia organisations and explores innovative approaches to planning and economic development that focus on the human resources of creativity, ingenuity and commitment rather than massive investments of financial capital. AUSTRALIA – Community housing provider SGCH has begun work on the first in a line of energy-efficient affordable housing developments made possible through a $60 million financing deal with the Clean Energy Finance Corporation. The 39-unit Lawrence Street, Peakhurst development will be built to an eight star NatHERS standard, meaning bills for its lower income residents, which will include essential workers like school and healthcare staff, should be greatly reduced. Lack of knowledge on the part of homeowners is one of the factors slowing demand for energy-efficient, sustainable homes, according to Harakeke Consultants founder Claudia Kaltenstadler. The wider property sector, including real estate agents and valuers, is still also on a learning curve regarding the benefits of healthy homes with lower running costs, she said. Originally from Germany, since moving to NZ in 2006 Ms Kaltenstadler has been advising builders, designers, architects and aspiring homeowners on improving home performance, using European standards for air tightness, insulation and reduced materials footprints as a reference point.